Bidding War For 2024 Summer Olympics, And Is Hosting An Olympiad Worth It Financially? It is not often thought about outside of the two-week period of the Summer Olympics, but when your city is bidding for the Olympics, it is a very hot topic. What I am talking about is the money that it costs to host the Olympics. As the IOC (International Olympic Committee) gets ready to announce the host city for the 2024 Summer Olympics this upcoming June, there are only two cities bidding. This was the case last week when Budapest and Hungary withdrew their bid in an attempt to bring the Olympics to their country for the first time. Now we are down to two – Paris and Los Angeles. On the surface, both seem like great candidates. Both have hosted the Summer Olympics before, twice each in fact. For Paris, it was in 1900 and 1924 and for Los Angeles it was 1932 along with the boycotted games in 1984. The costs to host the Olympics are astronomically high (ranging from tens of billions of dollars), having two candidates remaining to vote on might become the norm. Gone are the days where winning the bid was a reward, now it has become a financial burden on the city. While there is great economic benefits to host the games such as improved infrastructure, better transit, more jobs and escalated tourism in the following years, the multi-billion dollar question becomes, is it all worth it? 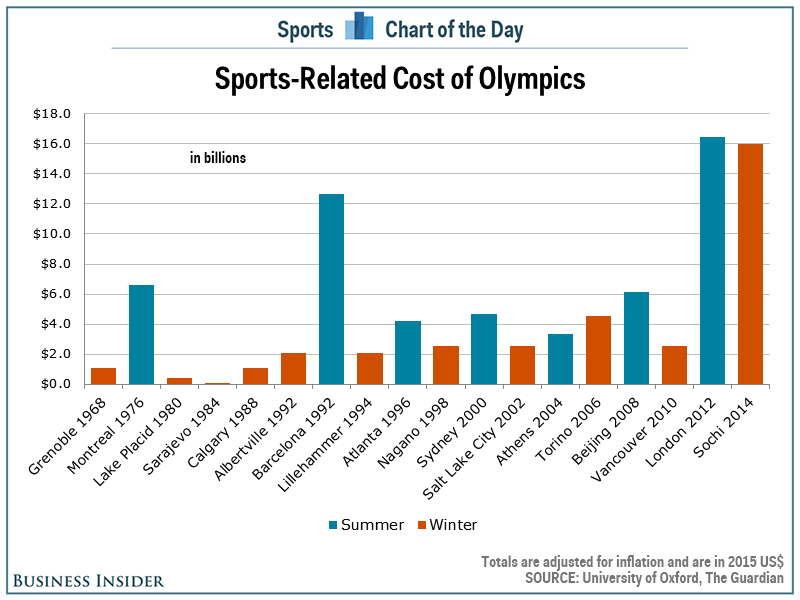 A chart in the Business Insider, describes how much each seasonal Olympic has cost respectively in terms of billions. Note: that last year’s 2016 Rio isn’t included. Generally speaking, it is estimated that it takes about 30-40 years to indicate if host city makes money on the games. The big issue becomes, what happens to all the venues? Some host cities do really well with the venues as they get turned into legacy buildings. In Vancouver, the curling arena was turned into a curling center for use of the community. On the other hand, other host cities make ill-advised decisions when trying to make use of these stadiums after Olympic performance. The 1976 Olympic Stadium in Montreal is a fine example of improper usage. Instead of the stadium becoming a suitable venue to serve a myriad of profitable and entertaining events, it instantly became a “White Elephant” over night when the Montreal Expos moved to Washington D.C. For those of you who aren’t familiar with the term ” White Elephant”, it’s described as a possession in which its owner cannot dispose of and whose cost, particularly that of maintenance, is out of proportion to its usefulness. The Olympic Stadium fits this definition because the stadium is never used outside of a preseason Toronto Blue Jays game or a Montreal Impact soccer game, where large crowds are expected. In the past, Montreal in 1976 and Athens in 2004 have done a poor job in using old venues. It is almost impossible to predict the winner of the bid for 2024 which will be announced on September 13th. Paris seems like the front-runner as the Olympics have never been outside of Europe in three straight Olympiads. However, Los Angeles will have a strong bid with so many venues still available from 1984 along with USA losing out on bids during previous Olympics when New York was unsuccessful in 2012 and Chicago was beaten by Rio in 2016. ← Innovative Statistics: Which Teams Posed As College Football’s Most Efficient Offenses And Defenses In 2016?